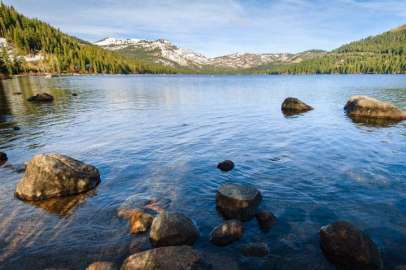 Formed by a glacier, Donner Lake offers beautiful views for everyone in this family oriented community to enjoy. Summer recreational opportunities include fishing, kayaking, sailing, boating and waterskiing as well as quick access to great hiking and mountain biking trails. The area west of the lake is a popular spot for rock climbers. Anyone can take advantage of one of the many public piers lining the shore and the Donner Lake Property Owners’ Beach Club provides members with access to a private beach on the west-end of the lake including a boat launch, playground, club house and snack bar. The east end beach can be accessed through Donner Memorial State Park and is a great dog-friendly place to picnic. Donner Lake is within an hour’s drive of some of the best downhill skiing in the Sierras, including Sugar Bowl, Boreal, Squaw Valley, Alpine Meadows and Northstar. In addition, there are numerous cross-country ski areas including Royal Gorge and the Donner Memorial State Park close by.